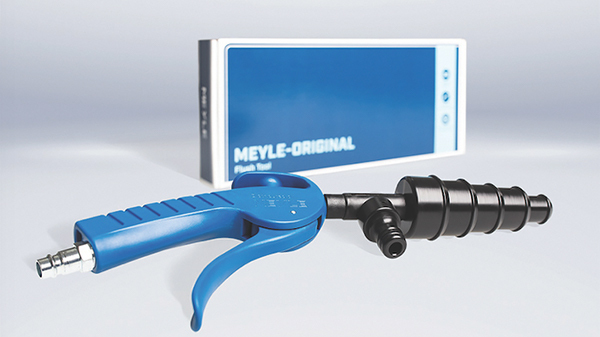 MEYLE is offering Autotechnician readers the chance to WIN one of three new flush tools. When replacing a water pump, you must flush the system, or the new pump is likely to fail due to contamination, warns MEYLE. Fix the cause and not just the symptom by flushing out particles caused by corrosion or limestone – this new tool cleans the cooling system using just water and compressed air. The engine must be completely cooled down before starting work. Drain the old coolant and clean the coolant expansion tank or replace if heavily soiled. Remove the upper and lower radiator hoses on the radiator. Thoroughly rinse the lower radiator hose for about two minutes with the radiator cap closed using the MEYLE tool. Short pulses of air work best. The upper radiator hose can then be flushed from top to bottom until the outflowing water is clear and deposits are removed. Next, remove the radiator hoses. Using the tool, thoroughly flush the upper radiator hose until the outflowing water remains clear, again short pulsating air blows aids the rinsing process. If the thermostat blocks during rinsing, remove it and replace with a new one. If possible, the circuit to the heat exchanger should also be flushed until the water runs clear. As a general rule, flushing the radiator, engine block and heat exchanger removes deposits left by corrosion as well as limestone and silicone seal residues. These can accumulate over many years and permanently impair the system’s health. Reattach all hoses, the drain valve and thermostat and check all necessary connections have been made. The cooling system can then be refilled with the coolant specified by the manufacturer. The mixing ratio should, for example, be checked with a refractometer. 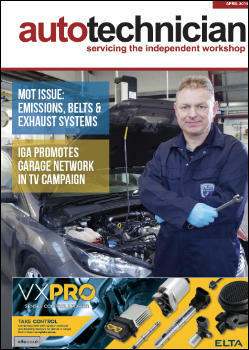 Finally, the system should be properly vented. A final check ensures there are no leaks. A short video tutorial is available on the YouTube channel MEYLE TV. MEYLE provides a 100,000-mile guarantee for all MEYLE water pumps and a 4-year guarantee for MEYLE-HD water pumps. The guarantee requires the cooling system to be flushed before installation. For your chance to win one of three MEYLE flushing tools, simply email your name, business name and contact telephone number to admin@autotechnician.co.uk quoting REF: MFT02 before the deadline of Monday 25th February.